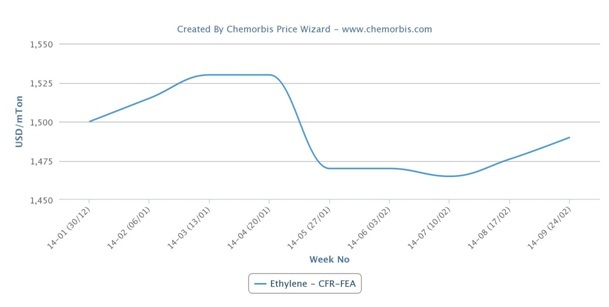 Spot ethylene costs have been steadily rising in Asia in contrast to comparatively weaker downstream markets mainly driven by current and upcoming cracker turnarounds, as per the pricing service of ChemOrbis. Higher ethylene prices received support also from firmer upstream costs in the region as energy and naphtha markets moved up with respect to the start of February. 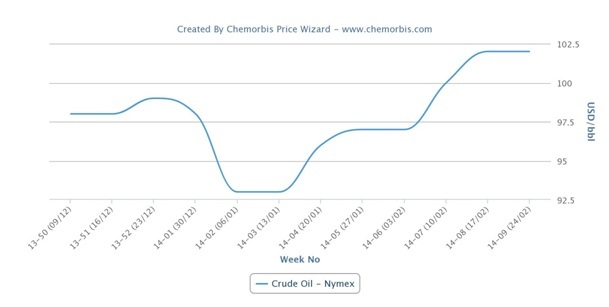 Crude oil futures on the NYMEX have risen by more than $6/barrel since February started while they were down less than a dollar week over week. Contracts first touched the $100/barrel threshold in the second week of February and held above this level since last week. 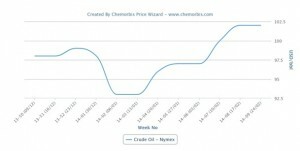 The jump in the energy complex throughout this month drove naphtha costs higher in the period. Spot naphtha prices inched up by around $5/ton on the week on CFR Japan basis, while they gained $15/ton from early February. 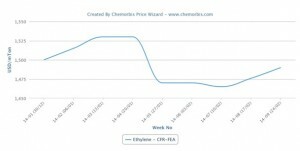 Spot ethylene prices followed suit with the latest figures indicating increases of $20/ton on CFR Northeast Asia and $30/ton on CFR Southeast Asia basis over the past week. They also rose $20-30/ton with respect to the first days of February. Reduced monomer supplies in Asia helped the spot ethylene market to move north since several crackers in the region have already been or are set to be under maintenance, as per ChemOrbis. Among production news, Asahi Kasei shut its 504,000 tons/year cracker located in Mizushima, Japan for a scheduled maintenance. The cracker will be offline between February 21 and April 14. CPC Corp.
brought its No.6 cracker with 720,000 tons/year capacity down on February 10 for a turnaround. The cracker is slated to restart by the middle of April. PTT Global Chemical unexpectedly shut its 515,000 tons/year cracker in Thailand due to technical problems on February 17. The shutdown at I4-1 cracker was to last for 20 days. The company also planned a turnaround at its Map Ta Phut cracker between February 9-March 17. The cracker has 461,000 tons/year capacity. In addition to those ongoing shutdowns, some Asian cracker operators plan a new round of turnarounds for March. Showa Denka plans to shut its 690,000 tons/year cracker in Oita next month. Shanghai Secco plans to carry on a turnaround at its cracker in China in March. The 1.1 million tons/year cracker will be offline for a month.